After Pauahi’s death, Kekūanāoʻa married Kīna‘u, and they became the parents of Lot Kapuāiwa, Alexander Liholiho, and Victoria Kamāmalu, making Keʻelikōlani a half-sister to these three. Keʻelikōlani was an important figure during her lifetime, known for her high rank in the Kamehameha lineage, her social position as a governor and woman of means, and for her character as a woman of dignity, both strong-willed and kind. She was held in high regard by the general populace, and treated lovingly or respectfully by the ranking chiefs, government officials, and the people of her time. As a Kamehameha descendant, Keʻelikōlani was part of the royal family and the court for as long as the Kamehameha dynasty ruled. Following the death of Kamehameha V, William Charles Lunalilo ascended the throne by election in 1873. Keʻelikōlani’s second husband (June 2, 1856) was the part-Hawaiian Isaac Young Davis, grandson of Isaac Davis, a British advisor to King Kamehameha I. The two had a son (1862,) Keolaokalani, whom Keʻelikōlani gave as a hānai to Bernice Pauahi. Keolaokalani died in about 6-months and Leleiōhoku died of pneumonia in 1877. Keʻelikōlani died in 1883 at Haleʻōlelo, her large hale pili native-style home on the grounds of Huliheʻe Palace in Kailua-Kona, Hawai‘i. This established the land-base endowment for Pauahi’s subsequent formation of Kamehameha Schools at her death. Princess Bernice Pauahi Bishop passed away a year later. Nā Lani ʻEhā (The Royal Four; the Heavenly Four) are four siblings who, among other accomplishments, demonstrated extraordinary talent as musicians and composers. They were born to High Chief Caesar Kapaʻakea and High Chiefess Analeʻa Keohokālole. In 1995, the Hawaiian Music Hall of Fame recognized Nā Lani ʻEhā as “The Patrons of the Hawaiian Culture,” noting they “were not only giants in the field of Hawaiian music but form the very cornerstones of subsequent Hawaiian culture and arts, and as such, ‘preside’ over the greats of Hawaiian music honored” in the Hall of Fame. David Kalākaua was hānai (adopted) by the chiefess Haʻaheo Kaniu, who took him to Maui. When Kalākaua was four, he returned to Oʻahu to begin his education at the Royal School. On February 12, 1874, nine days after the passing of King Lunalilo, an election was held between the repeat candidate David Kalākaua and Queen Emma – widow of King Kamehameha IV. Kalākaua won. By age 15, Liliʻu was already an accomplished musician and composer who could write music. Her best-known song ‘Aloha ʻOe’ was the first Hawaiian “hit” song outside of the Islands. 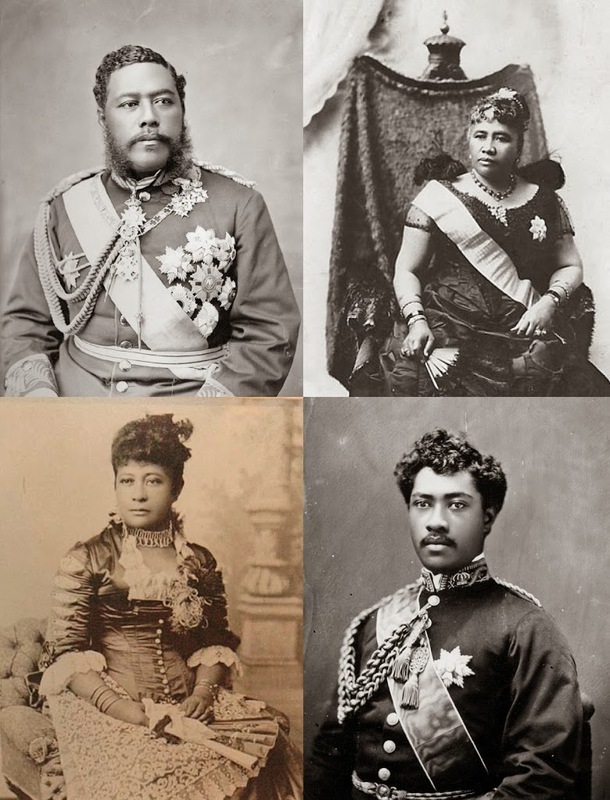 On April 10, 1877, King Kalākaua named her heir apparent to the throne of Hawaiʻi and changed her name to Liliʻuokalani. King Kalākaua died on January 20, 1891; Liliʻuokalani succeeded him to the Hawaiian throne. Unlike her brothers and sister, Princess Miriam Likelike was raised in Hilo, Hawaiʻi. It was after her return to Honolulu as a teenager that her musical endeavors began in earnest. With her sister, she led one of the three royal music clubs that held regular friendly competitions to outdo each other in song and poetry. ‘ʻĀinahau,’ the most famous of Likelike’s compositions, was written about their residence in Waikīkī. She wrote most of her compositions there. On October 16, 1875, a child was born to Princess Likelike and Archibald Cleghorn. The child, the only direct descendant of the Kalākaua dynasty, was named Princess Kaʻiulani. The youngest of “The Royal Four”, Prince Leleiōhoku was said by his sister, Lili`uokalani to have a talent for composition “really in advance” of the two princesses. He founded the Kawaihau Singing Club and soon he and his colleagues were winning most of the royal song club competitions. When his older brother became king, Kalākaua’s first act as King was to appoint Leleiōhoku, as successor to the throne, thereby restoring to the crown the function of selecting kings. Leleiōhoku married Ruth Keʻelikōlani, great-granddaughter of Kamehameha, a grand-niece to Kamehameha II and III, and a half-sister of Kamehameha IV and V. They had two children, only one of whom – William Pitt Kīnaʻu – survived childhood (but he died at the age of 17.) While serving as governor of Hawai‘i Island, Leleiōhoku died, only twenty-two years old. A recent program at the Hawaiian Mission Houses Historic Site and Archives focused on compositions written by Nā Lani ʻEha, four royal siblings, King Kalākaua, Queen Liliʻuokalani, Princess Likelike and Prince Leleiōhoku. Aaron Mahi, Kuʻuipo Kumukahi and Kaʻala Carmack first participated in a panel discussion about the four famous siblings. In recognizing Nā Lani ʻEhā, the Hawaiian Music Hall of Fame also called to attention their early music teacher, Juliette Montague Cooke of the Chiefs’ Children’s School. The school was created by King Kamehameha III, with the main goal of this school was to groom the next generation of the highest ranking chief’s children of the realm and secure their positions for Hawaii’s Kingdom. Seven families were eligible under succession laws stated in the 1840 Constitution of the Kingdom of Hawai‘i; Kamehameha III called on seven boys and seven girls to board in the Chief’s Children’s School. Cooke was an excellent musician, and introduced them to the joy of singing. Since chanting had been the tradition in Hawaiian culture, a latent natural talent was released when the Hawaiians were introduced to the phenomena of melody and harmony. They embraced their music lessons with verve and enthusiasm; singing came to them naturally, and they loved their music lessons. The image shows Nā Lani ʻEhā (Kalākaua, Liliʻuokalani, Likelike and Leleiōhoku.) In addition, I have added others similar images in a folder of like name in the Photos section on my Facebook and Google+ pages. When Kalākaua ascended to the throne in 1874, he named his youngest brother, William P Leleiōhoku, the heir apparent. Leleiōhoku was educated at Saint Alban’s College (forerunner to ʻIolani School.) An accomplished musician, he founded several choral societies. One of them was called Hui Kawaihau. The Hui Kawaihau name was based on a nickname for an American missionary woman in town who preferred iced water (‘Kawaihau’) over some of the alcoholic libations the others were enjoying. The Hui Kawaihau choral group had about fifteen members; it was more social than business. When Leleiōhoku died in 1877, King Kalākaua reorganized the Hui into a business group. Among the twelve hui charter organizers were some well-known names, including King Kalākaua; Governor Dominis, the King’s brother-in-law; Colonel George W. Macfarlane; Captain James Makee; Col. Curtis P. ʻIaukea; Governor John M. Kapena of the Island of Oahu; J. S. Walker and C. H. Judd; and Koakanu, a high chief of Kōloa, on Kauaʻi. Their first order of business was to sign on more members and contract for the cultivation of sugar cane on land in Kapaʻa, on Kauaʻi. The twelve organizers signed up thirty-two resident members. About the first of August, 1877, the members of the Hui – over twenty men, with about the same number of women and children – set out from Honolulu, on the steamer “Kilauea,” on the voyage to their new home on Kauaʻi. At the time, the districts of Hanalei and Līhuʻe shared a common boundary. Kawaihau was set apart by the King, who gave that name to the property lying between the Wailua River and Moloaʻa Valley. A bill was introduced into the legislature and the eastern end of Hanalei District was cut out and Kawaihau became the fifth district on the island of Kauaʻi. About the time the Hui was started, Captain James Makee obtained a concession from the King to build a sugar mill at Kapaʻa and establish a plantation there. He was the first manager of the Plantation, and had agreed with Kalākaua to grind in his mill all the cane grown by the Hui. The contract with the Makee Sugar Company (under which each members of the Hui who came to Kauaʻi had signed separately with the plantation) required each of them to plant two hundred and forty acres of cane the first year, and they were to receive, in payment for their cane, two-fifths of the returns from the sale of the sugar obtained from it. Each planter was required to plow his own portion of the tract and to buy his own seed-cane for planting. A portion of the seed cane came from the neighboring Līhuʻe Plantation, ten miles to the south, and the balance they brought from Lāhainā. Upon Makee’s death in 1878, his son-in-law, Col. ZS Spalding took over management of the new sugar venture. Spalding also started the neighboring Keālia Sugar Plantation. In the 1880s, Spalding built the “Valley House,” a Victorian-style wooden mansion, one of the finest on the island. From 1877 to 1881, Hui Kawaihau was one of the leading entities on the eastern side of the Island of Kauaʻi, growing sugar at Kapahi, on the plateau lands above Kapaʻa. As part of the infrastructure of the new plantation, the Makee Landing was built in Kapaʻa during the early years of the Makee Sugar Plantation. Today, in place of the old Makee Landing, a breakwater is located on the north side of Mōʻīkeha Canal. The Hui members all worked their share of the plantation – cultivating, irrigating and weeding the sugar cane under their supervision. But they were all new to the business of growing cane – being mostly city men from Honolulu – all clerks and office men, etc. The first crop was quite successful, netting the Hui over $17,000, from which was deducted the expense paid by the King for the Hui’s transportation to Kauaʻi, and the preliminary operations there – about $5000, which left enough to pay the members nearly $500 apiece, after paying the expenses. In spite of the successful opening of the enterprise, it soon encountered dark days. For nearly four years, troubles were increasing. Colonel Spalding advised them to sell out to the Plantation, and thus end all their troubles; but they would not agree. By 1881, four years after the favorable opening of the Hui’s plantation efforts, the members, disheartened and discouraged, had all drifted away, their property and leasehold rights, etc., passing into the hands of Colonel Spalding, the successor of Captain Makee as the head and principal owner of the Makee Sugar Company. The Hui Kawaihau of Kauaʻi had passed into history. In 1933, the Līhuʻe Plantation Co. purchased all of the outstanding Makee Sugar Co. stock and in the next year the mill was dismantled and combined with the Līhuʻe factory. (Lots of information here from “The Hui Kawaihau” by Charles S Dole and The Friend, April, 1920.) 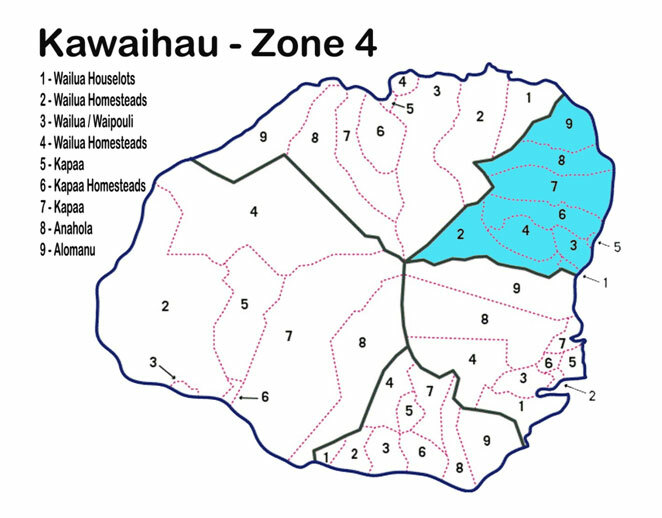 The image shows the Kawaihau District on the Island of Kauaʻi. In addition, I have added other images in a folder of like name in the Photos section on my Facebook and Google+ pages.